Quotes are like stray bullets. It's not fired for you, but it hits you. The best quote isn't having the most beautiful or the longest words, but the one that matches our feelings when we read it. Quotes are nothing but inspiration for the uninspired. Reality is the only word in the English language that should always be used in quotes. Quotes have no meanings for those who have no feelings. Life is like a quotation. Sometimes, it makes you laugh. Sometimes, it makes you cry. Most of the time, you don't get it. Too many people who write quotes think they are one copy-paste away from being bright minds. There are such feelings which the heart could not express. Some people liked to sing, dance, hurt themselves, suicidal, scream, cry, emote, write a song and many more things just to express ones feelings. But for me making quotes or writing is one way for me to lose steam. Quotes get you through days when you think no one gets what you're going through. 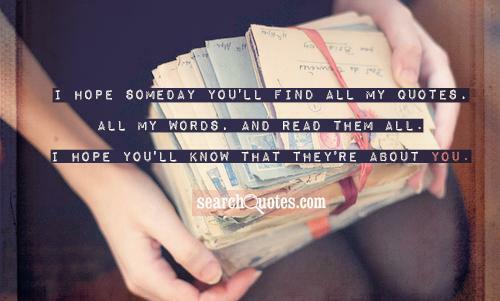 I hope someday you'll find all my quotes, all my words, and read them all. I hope you'll know that they're about you. Quotations are highly useful treasure that has been passed from one generation to another. Not all people are Nietzsche, Aristotle or Einstein. But yet, when the right circumstances strike, it is feasible that some quotations are born from ordinary people too which are abundant with meaning. Such quotations will be highly helpful for students or orators who make the best use of it. 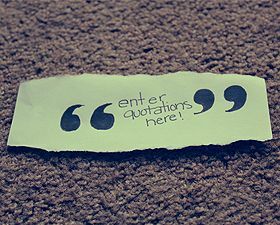 Quotations, when given in the right context and meaning, are capable of conveying the intended message in a crispy and sharp manner as compared to a load of words. Also, it gives great satisfaction when we find great people have also had the same line of thought as we do, under the same circumstances. This indeed is a surprise. For instance, quotations given on mother, love, education, and nature are so universal that they are given from an unknown author and fit so well to anyone in the remotest place on earth. Thus, quotations serve as great source of inspiration. Read these quotations and feel the universal feeling common to all that hold good for many years.